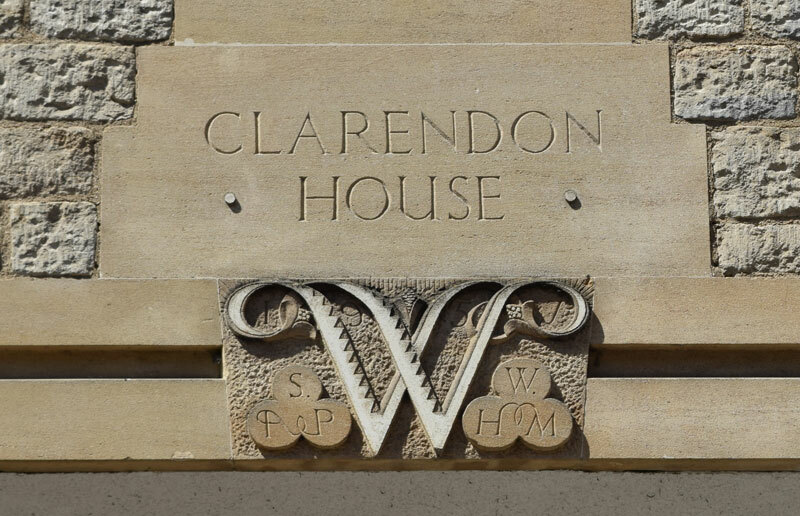 This inscription obviously marks CLARENDON HOUSE on the west side of Cornmarket, but the emblem below recalls an earlier use of the building. The ornate W stands for Woolworth, the company founded by Frank Winfield Woolworth in New York 1879. The date 1957 is entwined with the W, and the two shamrocks below contain the initials SAP and WHM (the latter probably standing for William Harvey Moore). F. W. Woolworth Ltd moved into its first Oxford shop in 1924, which was in the former Roebuck Inn on the east side of Cornmarket. In 1957 it moved into a new building it had erected on the west side of Cornmarket, first demolishing the old Clarendon Hotel. When I look at this very wonderful building from the Mayor’s Parlour, I realise what you have achieved. The inside is staggering and, inside and out, you have nothing to be ashamed of. I can say that, as a city, we are very proud of your frontage.